If your cab firm operates very common taxi journeys – such as airport transfers to and from the centre of town – or you simply want to provide example taxi journeys and pricing, we are pleased to announce, with the latest TaxiMap plugin release (v.3.9.12b released today for all users), pre-defined journeys can now be created with a simple link. 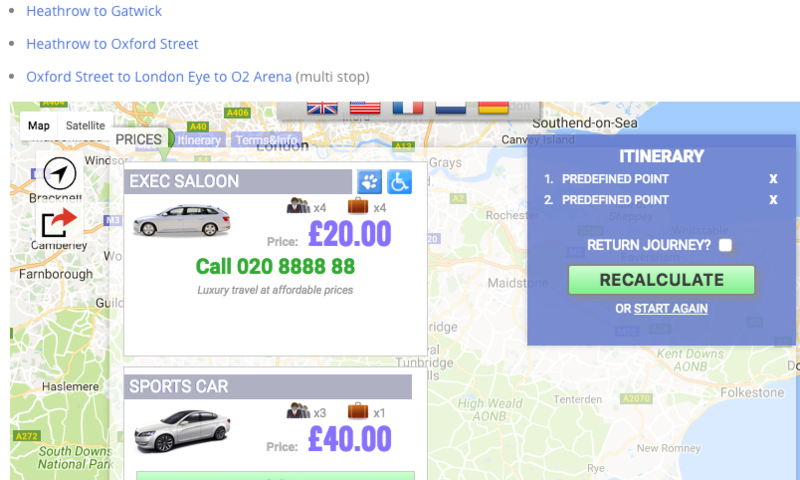 With predefined journeys taxi companies can, for example, publish a list of common journeys as links. If using the iFrame implementation of the TaxiMap plugin, these links could be positioned along side or above the map for quick access. First, please note predefined journeys still provide calculated prices, i.e. the price of the journey is calculated from TaxiMap user settings, it is only the stops that are predefined (not the price). For each stop there are corresponding coordinates assigned via the “p” variable in the URL and each “p” variable is appended to the URL with an ampersand (&). So to create predefined journeys, all that is required are the coordinates or stops and to correctly format the link URL. We’ve done a little more work in our example above to streamline the experience… We’ve targeted the iFrame from the links and also appended “f=1” to ensure the booking form loads formatted for iFrames. These enhancements should be simple to execute and web designers or those with a little HTML knowledge should be able to set up predefined taxi journeys with relative ease. Lastly, you’ll also need to change the value of the “uid” parameter to your customer ID which is available at the top of the status box after you log in. To help find taxi stop/point co-ordinates we’ve created a dedicated Lat/Lng Co-ordinate Finder.